Located in Toronto’s Junction, 77 Wade Avenue will be a purpose designed and built office with collaboration space for the new digital age industrial worker. 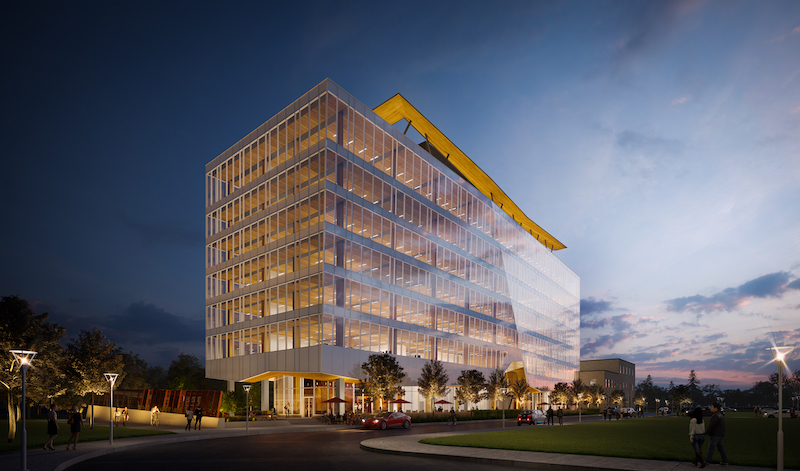 Designed by Bogdan Newman Caranci (BNC) Architecture and Urban Design, and developed by Next Property Group, 77 Wade Avenue will be eight storeys and approximately 150,000 square feet, making it among the tallest modern mass timber office and commercial buildings in Canada targeting LEED Gold, and the first of its kind to be built. The overall design celebrates the advanced use of mass-timber construction within the ever-evolving architecture of Canada. The development and design of 77 Wade maximizes and streamlines the inherent structural and aesthetic qualities of exposed wood construction in a new and modern way; ultimately showcasing both our Canadian talent pool and our renewable wood resource. The building’s envelope will predominately be clad in a folded plain curtain wall to expose the innovative structure within, while also adding a dynamic form to the streetscape. The approach to the building is unified with an origami based geometric soft and organic front entrance, retail and flexible collaboration spaces. Perched above the form is a wood canopy that creates shading for the outdoor amenity and social space. The rear of the building has a sunken parking area as well as a unique bike storage feature, connecting pedestrians and cyclists though the site, from the adjacent and elevated GO Barrie line corridor to be constructed complete with a linear park and Multi-Use Trail below (aka Metrolinx’s ‘Davenport Diamond’ project).